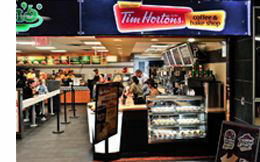 Tim Hortons, the major Canadian QSR player and household name north-of-the-border, made a major move in the U.S. coffee wars in July 2009, transforming 12 of its competitor's Manhattan locations into Tim Hortons over the course of one weekend. Tim Hortons enlisted Coltrin & Associates to establish brand presence in the extremely competitive U.S. coffee market through the announcement of the company's New York City expansion. Coltrin fueled the buzz surrounding the New York City launch, garnering significant press on the NBC's Today Show, Today Weekend, CNBC, Fox Business, the New York Times, the Associated Press and Bloomberg News, among others.